Frank Herbert wrote Dune, one of the seminal works of science fiction and 1966 Hugo award winner, in 1965, and the subsequent five books in the series (in order: Dune Messiah, Children of Dune, God Emperor of Dune, Heretics of Dune, and Chapterhouse Dune). Herbert’s futuristic universe with empirical and religious overtones has been many a reader’s introduction into the science fiction genre. Sadly, Herbert passed away in 1986 while working on a seventh novel in the series. More than a decade after his death, Herbert’s outline and notes were found by his son, Brian, who worked with noted science fiction author Kevin J. Anderson to finish the seventh book in the series (which actually became two separate books). Herbert and Anderson did not stop there, they actually wrote three prequels to Dune, providing further back story to the original novels and helping set the stage for the original Dune. They then wrote Paul of Dune, released in 2008, a novel set during the twelve-year time gap in the events of Dune and Dune Messiah. It tells the story of the difficulties Paul has as the Emperor of the Known Universe while his galactic jihad conquers worlds that have not sworn their allegiance to him. At the same time, we are treated to flashbacks to Paul’s life before coming to Dune, showing important events in his development while his father, Duke Leto Atreides, tries to form an important political alliance. In both the present time and flashbacks, we see how Paul is forced to come to terms with his role in life, as an Atreides heir in the flashbacks and as the new Emperor in the present, and the heavy responsibilities attached in both cases. Finally, there is a continuing storyline with Count Fenrig, a master assassin, as he tries to scheme behind the scenes against Paul. The book sets up the events in Dune Messiah beautifully, providing a richer background to the story, while not interfering in the original Frank Herbert storylines. I truly enjoyed reading this book and found it very hard to put down, especially the last third. This is a book that will definitely grab the attention of science fiction fans, but could also be of interest to those who read books with political intrigue. There are enough action scenes to keep you wanting to read on (the wedding at Caladan and the dinner with the Fenrigs are two of my favorites), but the political twists and turns and the way different characters wield power are the real plot drivers. I also appreciated that the authors did not rely on lot of exposition to explain who characters are (which is good since that’s a pet peeve of mine), but did enough where you can recall who someone was if you haven’t read Dune in a while. Still, I would recommend that you read the original Dune or listen to the unabridged audiobook (available on Audible with a great cast), since that will help you better identify the characters and understand their motivations and limitations in Paul of Dune. In a pinch, you could watch the movie version with Kyle MacLachlan (as Paul) and Sting, which differs from the novel but is close enough to get you up to speed for Paul of Dune. The Sci Fi (now SyFy) network released a miniseries based on Dune in 2000, which was more faithful to the book and stars William Hurt as Duke Leto. Both are available to buy from Amazon or rent from Netflix. Last, but not least, Brian Herbert and Kevin J. Anderson have collaborated on yet another Dune novel. 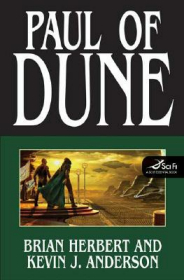 The Winds of Dune, tells the story of what happens between Dune Messiah and Children of Dune, through the experiences of Jessica, Paul’s mother, and will be released on August 13, 2009. Buy Paul of Dune by Brian Herbert and Kevin J. Anderson on Amazon by clicking here .